PM Modi received the country's first container cargo transported on inland waterways from Kolkata. 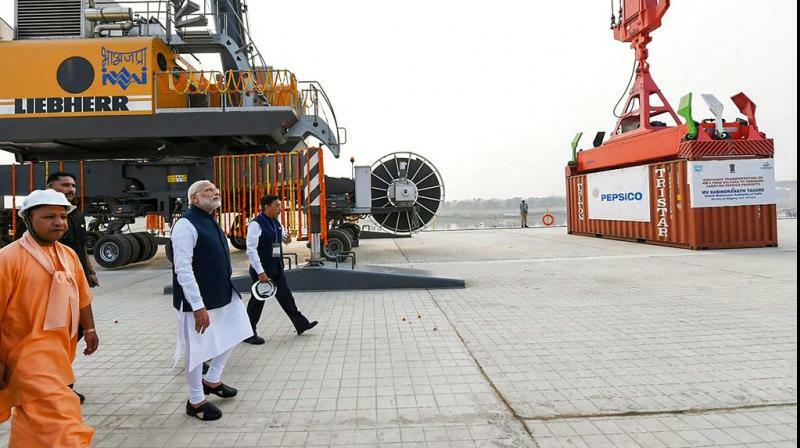 Varanasi: Prime Minister Narendra Modi on Monday inaugurated India's first multi-modal terminal on the Ganga river in his parliamentary constituency in Varanasi and received the country's first container cargo transported on inland waterways from Kolkata. The Prime Minister was accompanied by Uttar Pradesh Chief Minister Yogi Adityanath, Union Transport, Highways and Shipping Minister Nitin Gadkari and BJP state president Mahendra Nath Pandey, who is also the MP of the neighbouring Chandauli Lok Sabha constituency. Earlier, upon his arrival in Varanasi, the Prime Minister was given a detailed presentation of the waterways and watched a short film on the viability of the waterways between Varanasi in Uttar Pradesh and Haldia in West Bengal. According to an official statement, the Centre's Jal Marg Vikas Project aims at developing the stretch of the river between Varanasi and Haldia for navigation of large vessels weighing up to 1,500 tonnes to 2,000 tonnes. Its objective is to promote inland waterways as a cheap and environment-friendly means of transportation, especially for cargo movement. The Inland Waterways Authority of India (IWAI) is the project implementing agency. The project entails construction of three multi-modal terminals (Varanasi, Sahibganj and Haldia), two inter-modal terminals, five roll-on-roll-off (Ro-Ro) terminal pairs, new navigation lock at Farakka in West Bengal, assured depth dredging, integrated vessel repair and maintenance facility, differential global positioning system (DGPS), river information system (RIS), river training.